Vintage NZ Fruit Label Poster "Packham's Triumph"
With the outstanding sales success of NZ Fine Prints' series of vintage travel and tourism posters released over the past few years (see previous articles NZ Vintage Poster Collection Launched and New Series of Vintage Posters) we have been busy sourcing and re-printing our latest collection of vintage posters, this time finding classic and/or famous advertisements designed between 50 and 100 years ago. 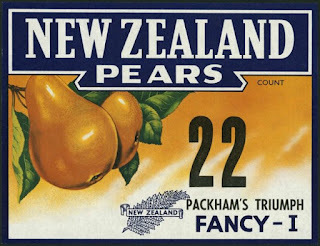 Illustrating this article are a couple of the highlights, a NZ fruit label for "New Zealand Pears: Packham's Triumph" and the superb French vintage Martini poster below. Although we are still adding to the NZ vintage tourism and travel poster series the particular focus of our latest collection is on posters advertising iconic kiwiana brands and classic food and alcohol advertisements from famous Italian designers such as Marcello Dudovich or French poster designers, for example Henri Toulouse-Lautrec and Alphonse Mucha. As well as being listed in our vintage poster gallery many of these new vintage designs are destined for our relatively new food & drink category - a culinary themed collection of art prints and posters to decorate kitchens, dining areas (as well as restaurants and cafes). 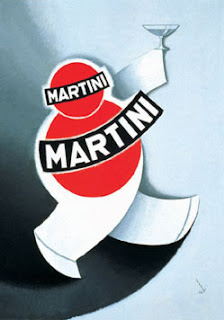 Vintage advertising is a engaging way of decorating your home or office with a collection of unified yet eclectic artwork. Both NZ and imported posters can be hung side by side because they are united in theme (and perhaps period) but can be of disparate subjects that resonate with the owners or inhabitants of the space. Really well designed vintage posters. They give off a simple yet accurate message. I really enjoyed looking and understanding their true message.